Grant’s strengths and his faults have been debated for well over a century. I can relate two little known incidents that illustrate what was, simultaneously, his most disarming and undoing personal trait. Grant was fiercely loyal to people who befriended him. Grant spent some his most challenging years in St. Louis, 1854-1860, moving about in the Southern society of his wife’s family, centered in Southwest St. Louis County. This was then a very rural world; he counted as his “neighbors” people who lived many miles from his Hardscrabble Farm. Dr. Barrett (some times spelled Barret) was a member of a prominent Virginia/Kentucky clan that emigrated to St. Louis before the Civil War. In 1864, he along with a cousin (pre-War U. S. Congressman John Richard Barrett) became embroiled in a national controversy. An investigation got underway into the activities of a clandestine group of Southern supporters known as the Sons of Liberty. James Barrett was targeted as a member of the “Northwest Conspiracy,” alleged to be a massive operation to aid the Confederate war effort and overthrow the government of the United States. The investigation, centered on the Son of Liberty’s activities in Missouri and Indiana, snared Indiana copperhead congressman Clement L. Vallandigham and others. Later in the year, one Lambdin P. Milligan and four others were tried by a military tribunal in Indianapolis – the trial timed to precede the national elections in November, 1864. Milligan was sentenced to hang. He was freed when the U. S. Supreme Court in 1866 issued a landmark Opinion, Ex Parte Milligan, which held that military courts had no jurisdiction to try civilians where civil courts were operating. Dr. James Barrett of St. Louis was an unindicted conspirator in the trial of Lambdin Milligan. His activities were prominently noted in the testimony of witnesses. But Barrett was not brought to trial. On June 25, 1864, Ulysses Grant sent a telegram from headquarters in City Point, Virginia, to the Secretary of War. Grant arrived in City Point ten days before he paused to write his telegram to Secretary Stanton. He had just completed another of his master strokes, outflanking Lee’s Army of Northern Virginia after Cold Harbor and landing in Lee’s rear at Petersburg. Grant had on his mind the plight of a country doctor who once supported him in his bid to become County Engineer in St. Louis. “Tiger John” McCausland graduated first in the VMI class of 1857. When the Civil War began, McCausland organized Virginia’s Rockbridge Artillery, then served in successively more important command positions in the Confederate army. He famously escaped from Ft. Donelson in 1862, before Grant captured the place and most of the army that defended it. 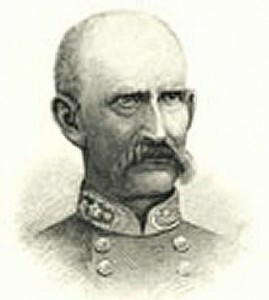 As a Brigadier General of cavalry in 1865, he even escaped Grant at Appomattox. McCausland’s military reputation, otherwise distinguished, was stained by the burning of Chambersburg, Pennsylvania, in July, 1864. Under orders of his superiors, McCausland entered the town and demanded payment of reparations for Union depradations in the Shenandoah Valley. When his demand was refused, he burned the town. At the close of the War, McCausland was indicted by a Pennsylvania grand jury for arson; He lived in Mexico and in Europe for a time, finally returning to the United States in 1867 after Ulysses Grant intervened to quash the Pennsylvania indictment. Tiger John McCausland was born in St. Louis in 1836, son of a John McCausland who gave the name to McCausland Avenue. The elder McCausland owned large tracts of land in downtown St. Louis, and devised St. Louis’ first system of taxation. He died the same year his wife died, 1843, leaving John and his brother orphans. In 1847, John moved to what is now West Virginia to be raised by an uncle. He had lived with his paternal grandmother in St. Louis County before leaving for the east, but no doubt often visited his aunt Elizabeth Marshall at her home “Fairfax,” restored and standing in Rock Hill near Manchester Road. The National Register application for McCausland’s post-war home near Henderson, West Virginia states that Ulysses Grant was “an old family friend of the McCauslands.” Enough said.